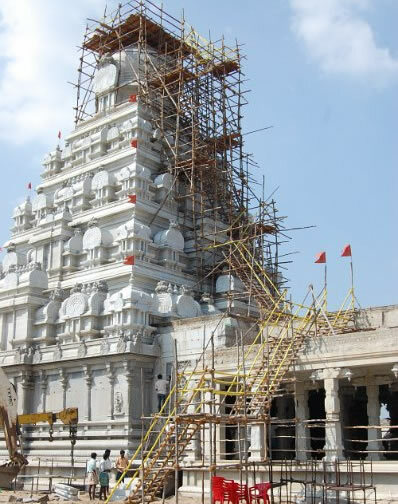 A great temple for Pujyasri Chandrasekharendra Saraswathi Swamiji, 68th Shankaracharya of Sri Kanchi Kamakoti Peetam, built at Orikkai, a suburb of Kanchi about five km from Kanchi is to be consecrated this 28th Jan, 2011. The temple is unique in many ways that embodies the age old tradition combined with modern aspirations. The temple falls under the category of suddha variety, meaning entirely built of one material, namely stone. There are other temples built of mixed materials like stone, bricks, wood, metal and mortar, that are called misra vimanas but when built of one material alone, as in the case of the Great Temple of Thanjavur, it comes to be called Shuddha Vimana, generally built by Emperors. Secondly, the main temple is about one hundred feet in height, symbolizing the life span of His Holiness who lived amidst us for nearly one hundred years. All ancient temples were built, reflecting certain basic philosophies and this follows those traditional concepts. 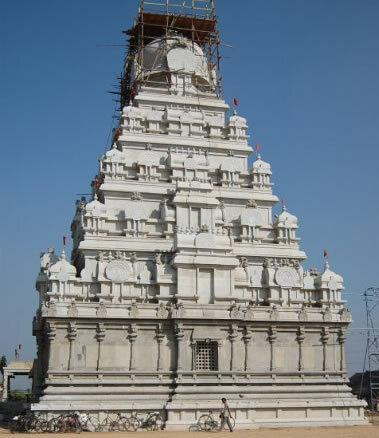 The superstructure called the Sikhara is about 56 feet and the height is one and three fourth, the width that is 1: 1.3/4 proportions bears a particular name indicating happiness (Ananda vimana), according to the sthapati. This was built by Ganapathi Sthapati, one of the foremost traditional Sthapatis of Tamilnadu, who comes in the family of the builders of the Thanjavur temple. He was ably assisted by his son and brothers. His other cousin brother also named Ganapathi is the famous one who designed the Valluvar Statue and the Valluvar Kottam. 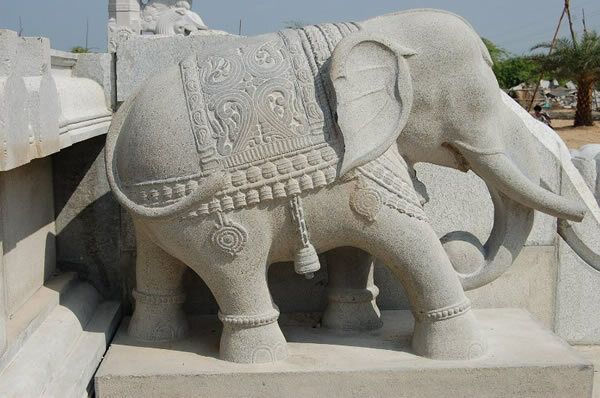 Both the Ganapathis belonged to the village Pillaiyar patti near Karaikkudi in Tamilnadu and bear the name of Ganesa of that place. Both are distinguished masters of architecture and sculpture. 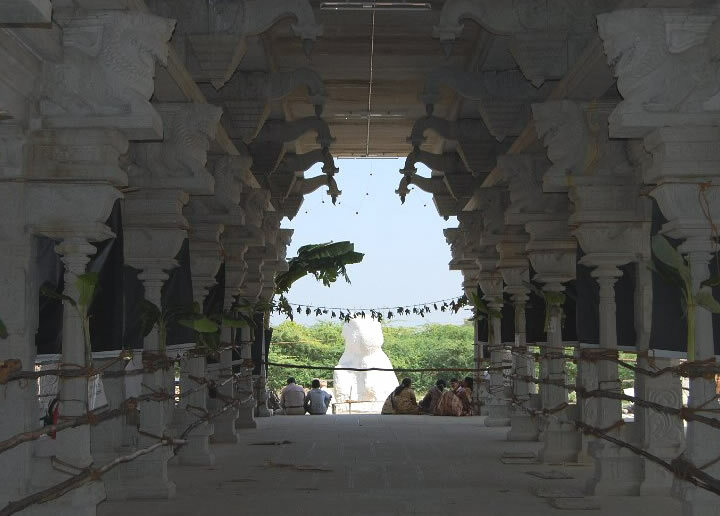 The white granite stones for this temple have come from a village named Pattimalai kuppam about 50 miles from Kanchipuram. The temple consists of two parts, the main vimana with sikhara and second the front mandapa with one hundred pillars. The main sikhara is built on a high upapitha and with the traditional with several musings. The sikhara is built in five storeys topped by the stupika also made of stone. The sikhara is beautified with rows of corner kutas, intermediate shalas, and the central Projections (bhadras) provided with windows (jalas) for lighting and ventilation. 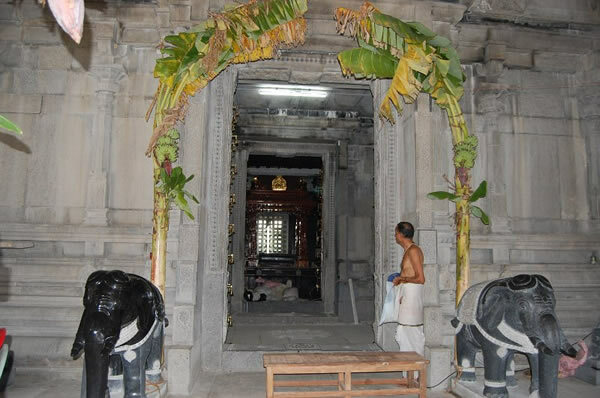 The inner sanctum is not the usual garbhagraha type but is a mandapa with raised pithika with four pillars at the corner. There is passage to go around and another concentric passage which is spacious to go around. Thus, there are two concentric passages around with mandapa in the centre where a Portrait of His Holiness will be enshrined. In front of His portrait is to be consecrated His Padukas (sandals) made of sandal wood and covered with gold plate. Essentially, it is a Mandapa and hence called Paduka Mani mandapa. The Architectural treatises call this type of structures as Mandapika Prasadas. Such structures are known from early times. A typical example comes from Srinagar , in Kashmir where the famous Sankaracharya temple is built as Mandapika prasada. Originally, the Sankaracharya temple had circular garbha graham and is a very ancient temple. Around 1644, a Hindu King named Gopadeva added the central Vedika of the sanctum supported by four pillars. There are many such pillared sanctums built in the time of the Gupta kings in the fourth and fifth centuries. For example, such pillars temples are in Vidisa in Madhya Pradesh. Also, there is a fine temple in northern Karnataka near Badami (the ancient Vatapi). Such temples were not only built in India but also in ancient Cambodia. One of the most ancient temples at Sambhor Prai Kuk, in North Eastern Cambodia, assigned to 4th cent is also built in this form. In fact, most other temples in Cambodia are built in the mandapika style with a mandapa in the centre of the sanctum to enshrine the deity. Mahaswamiji was a great admirer and keen lover of the history of Cambodia and it really seems to be a divine coincidence that this mandap dedicated to him recalls this tradition. Another significant feature of this temple is two significant sculptures introduced for the first time portraying two well known dhyana slokas in Sanskrit. 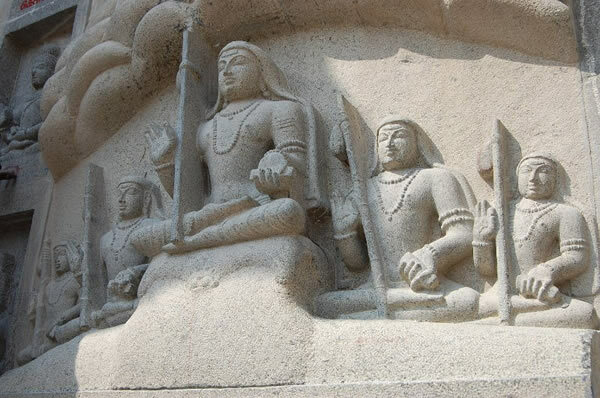 The sculpture on the south wall of the main temple portrays the Guru Parampara - Narayana, Brahma, Vasishta, Sakti, Parasara, Vyasa, Sukha followed by Gaudapada, Govinda yogindra, and (Adi) Sankaracharya and His disciples. This is an illustrious sculpture that would enable the visitor to correlate the dhyana sloka recited by all with the sculpture and is certainly a fine way of introducing art of sculpture to the devotees. 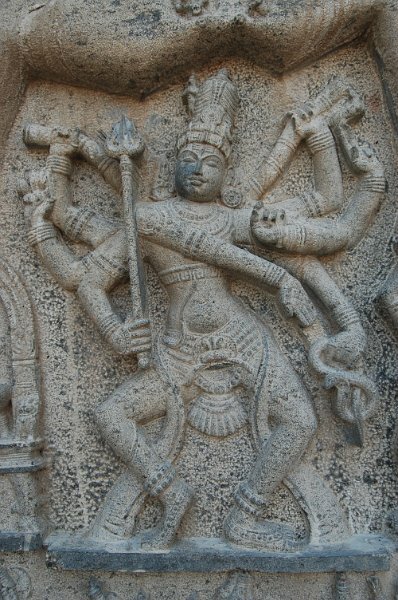 Similar is the sculpture on the northern wall that depicts the Pradosha Tandava of Siva based on a sculpture from Badami 6th cent. Visitors to the temple who know this verse of Sandhya tandava would welcome the portrayal. 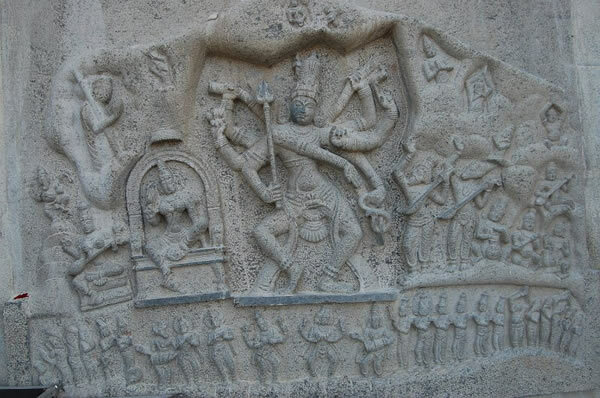 There is another sculpture on the southern wall of the temple representing a Ganesa. It is a beautiful sculpture that would attract the attention of art lovers. The entrance to the sanctum also has some interesting sculptures. 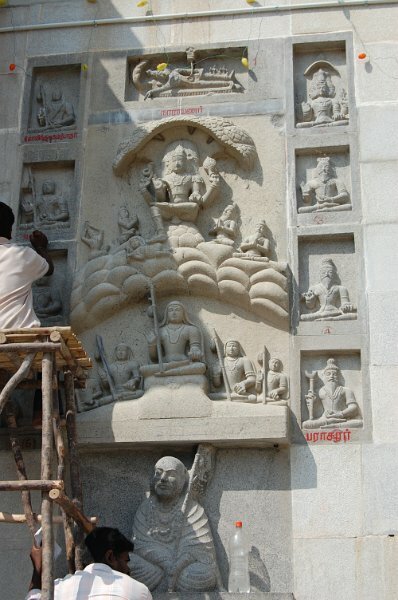 Sculptures of both Ganga and Yamuna are portrayed at both the door jambs of the entrances. In addition, the creeper designs here portray 16 forms of the Guru at the outer door jambs while the inner entrance depicts the twelve Jyotir lingas. The front mandapa built of one hundred pillars is conceived in the form of a cosmic chariot drawn by horse (under carving). Built in five bays, the central ceiling carries a mandala of the 12 rasis symbolically indicated by Mesha, Rishabha, Mithuna etc. The mandapa has a very well laid out stepped entrances on three sides. The steps are decorated with caparisoned elephants. The porch in the front has wheel with spokes symbolically depicting the twelve rasis – the twelve months. 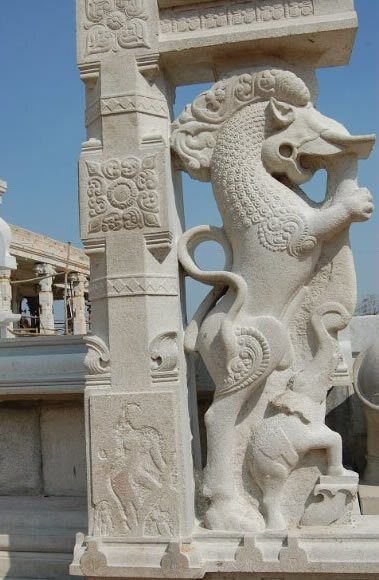 Once the horse sculptures are ready and fitted, it would resemble celestial horses drawing the chariot of cosmic time and space in which the devotees are likely to move through the cosmic presence. The huge nandi in front is a huge monolith and after finishing touches are given, it would be one of the great nandis in Tamilnadu. The temple it must be understood is the tallest and traditionally well laid out physical space in Tamilnadu that has been undertaken in this century.